Catch the magic of the moment! 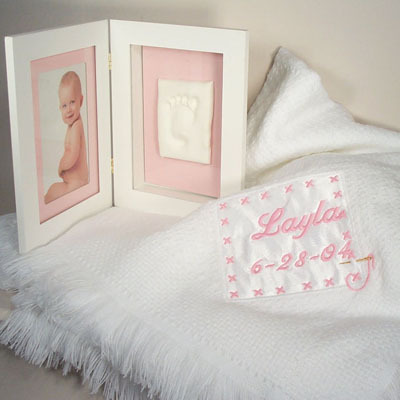 Our personalized shawl blanket and footprint picture frame combination makes a thoughtful and lasting gift. Footprint kit is easy and ready to use (requires no mixing or baking). Just place baby's foot or hand into the soft, non-toxic clay. Picture Frame measures 15" x 1 1/2" x 12" high. Shawl blanket comes personalized with baby's name (first name only) and christening date or date of birth. Please Note: Personalized items may only be returned if they are defective, or we have made an error in spelling. These items will be fixed or replaced. We do not offer refunds on personalized items. Please be sure of spelling and dates before you make your order as items that have errors due to a mistake in ordering will not be accepted for a refund or exchange.